It is easy to use an indoor dining table outside for a patio, particularly if you are unconcerned about exposing the table to dirt, sun and moisture. Because most indoor dining tables are made of wood that is not treated to withstand outdoor conditions, they are susceptible to water damage. Additionally, there is typically no hole in an indoor table to place an umbrella to create shade. But you can safely use most indoor dining tables outside on a temporary basis. You'll have the best results on a clear day with the protective covering of a tablecloth. Place wooden tables meant for indoors on the patio on a temporary basis for a special meal. Decide whether your indoor dining table can withstand any moisture or sun exposure. Do not put it outdoors if you are afraid of damage to the table. 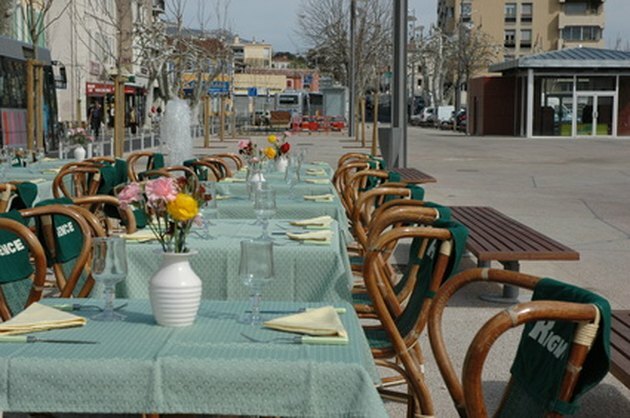 A tablecloth temporarily protects a table outdoors. Select a waterproof tablecloth to protect an indoor table from outdoor elements. Select a standard, non-waterproof tablecloth for fairly good protection. Leave the table uncovered if you don't mind a little sun and moisture exposure, but be prepared to see some effects from the sun. Move the table outside to the patio. Choose a spot where the table is level and comfortable. Cover it with a tablecloth. Add weights to the tablecloth to keep it from blowing away. Remove the table after it serves its purpose and replace it indoors. This article was written by the CareerTrend team, copy edited and fact checked through a multi-point auditing system, in efforts to ensure our readers only receive the best information. To submit your questions or ideas, or to simply learn more about CareerTrend, contact us [here](http://careertrend.com/about-us). Can You Use an Indoor Pool Table on an Outside Patio?